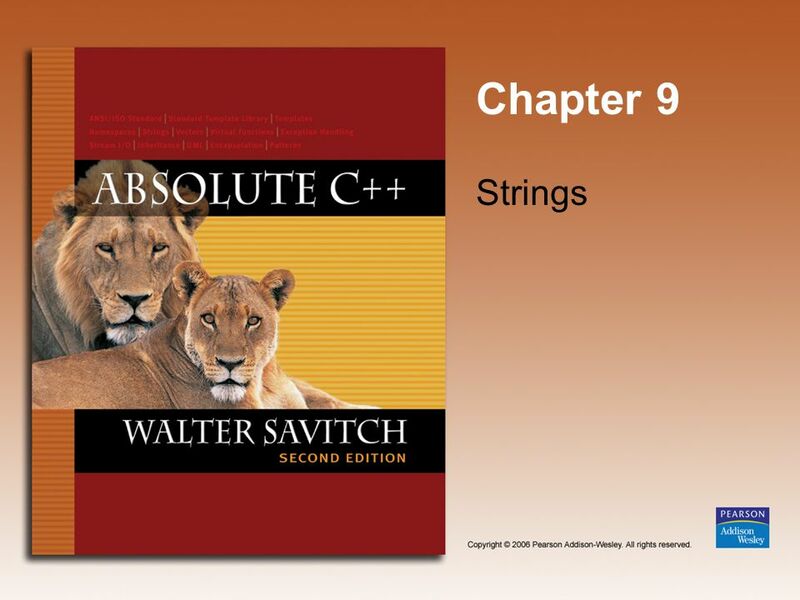 Chapter 9 Strings. Copyright © 2006 Pearson Addison-Wesley. All rights reserved. 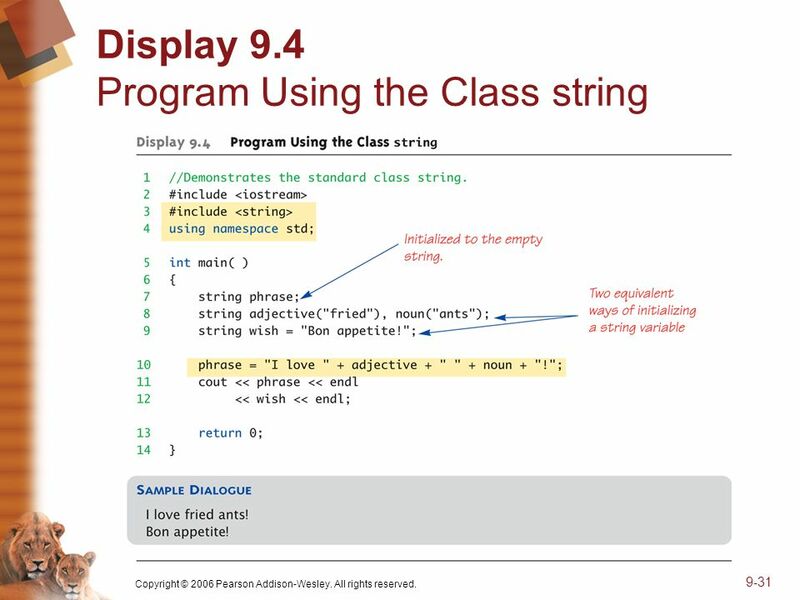 9-2 Learning Objectives An Array Type for Strings C-Strings Character. 9 Copyright © 2006 Pearson Addison-Wesley. All rights reserved. 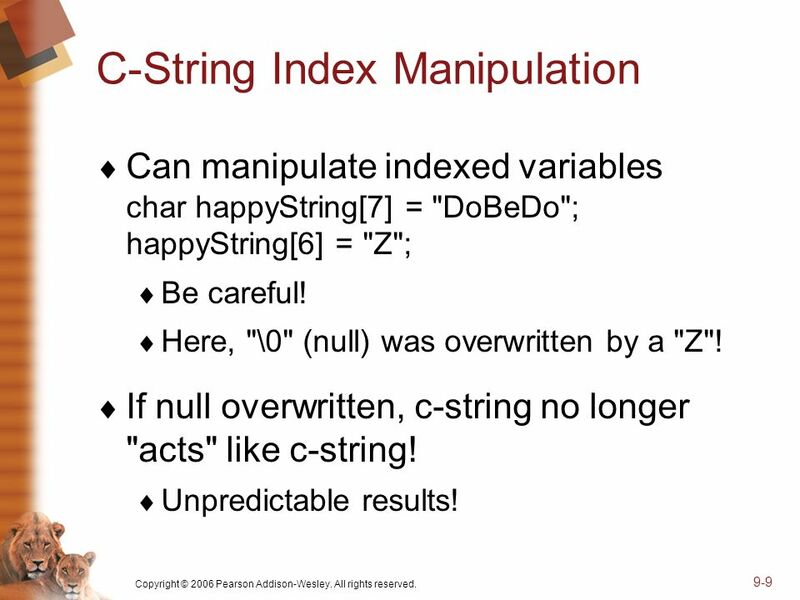 9-9 C-String Index Manipulation Can manipulate indexed variables char happyString = "DoBeDo"; happyString = "Z"; Be careful! Here, "\0" (null) was overwritten by a "Z"! 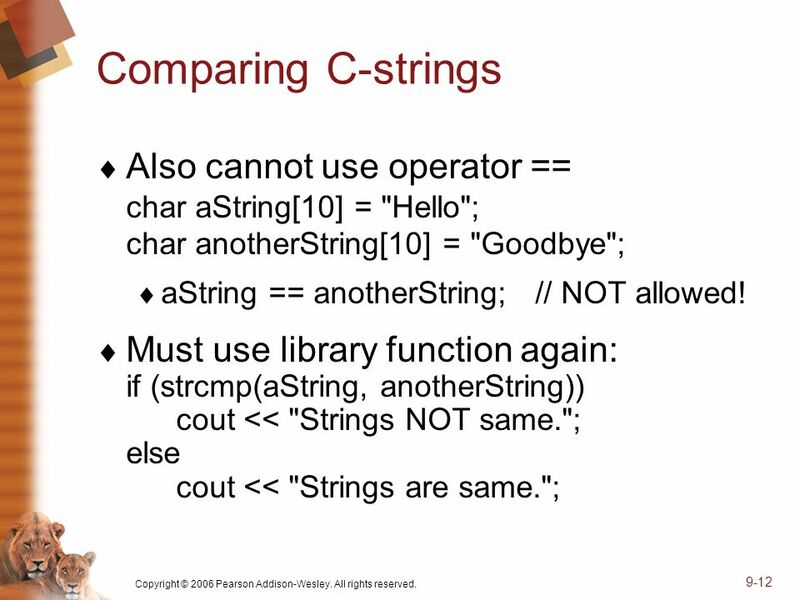 If null overwritten, c-string no longer "acts" like c-string! Unpredictable results! 11 Copyright © 2006 Pearson Addison-Wesley. All rights reserved. 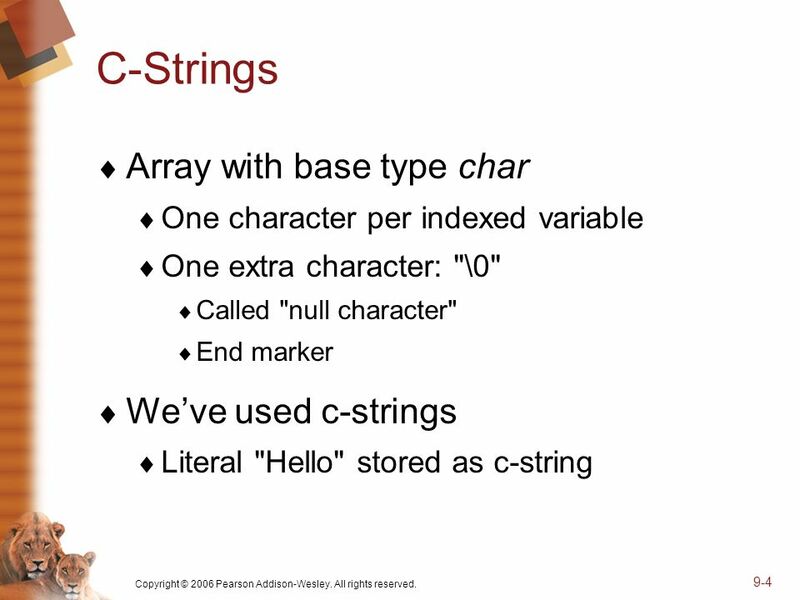 9-11 = and == with C-strings C-strings not like other variables Cannot assign or compare: char aString; aString = "Hello";// ILLEGAL! 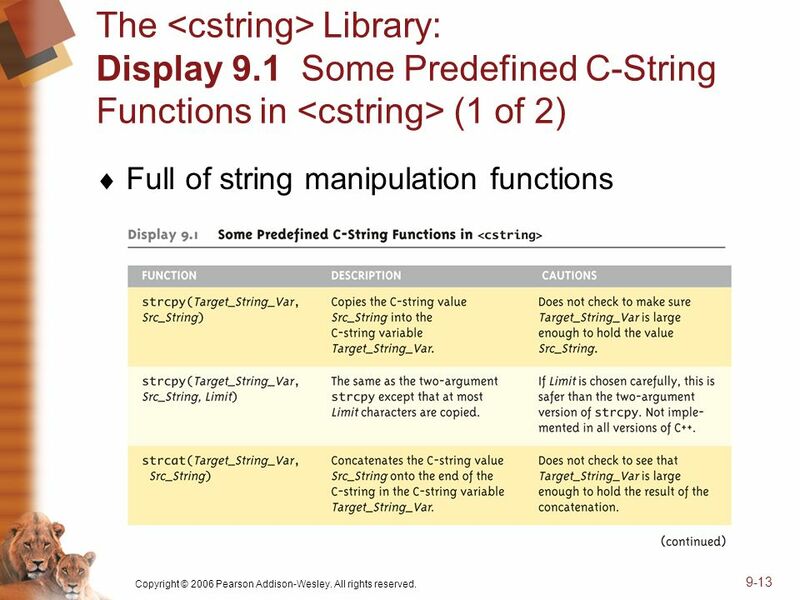 Can ONLY use "=" at declaration of c-string! 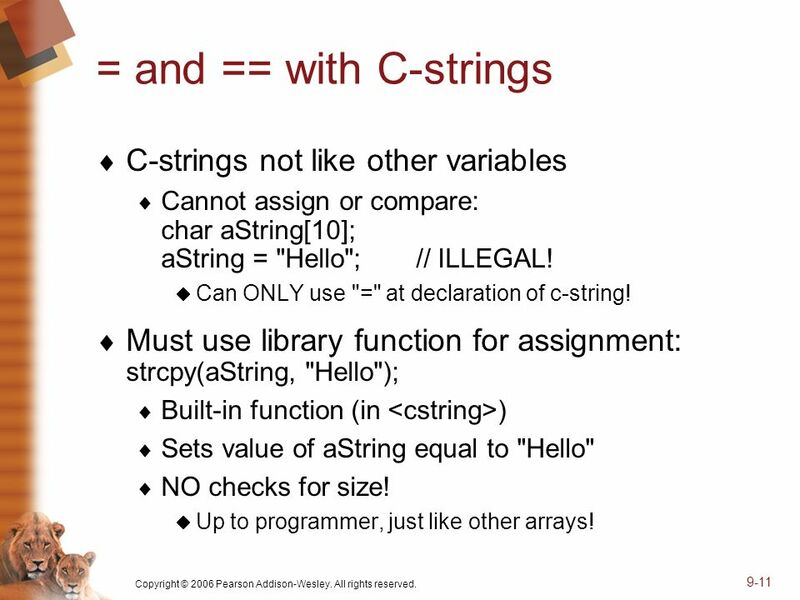 Must use library function for assignment: strcpy(aString, "Hello"); Built-in function (in ) Sets value of aString equal to "Hello" NO checks for size! 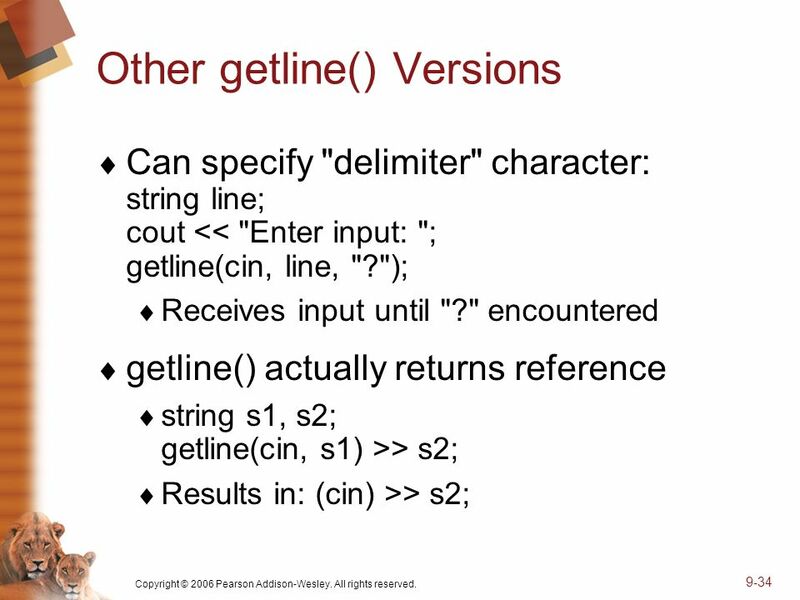 Up to programmer, just like other arrays! 16 Copyright © 2006 Pearson Addison-Wesley. All rights reserved. 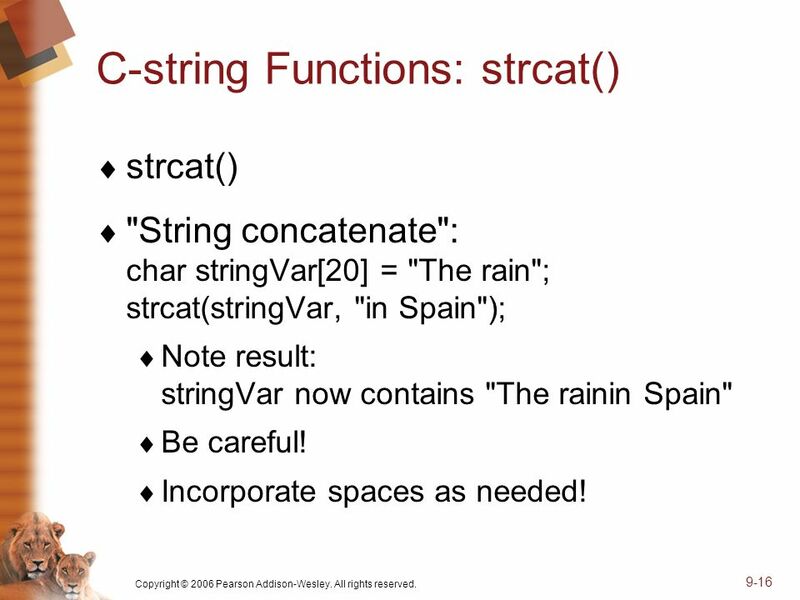 9-16 C-string Functions: strcat() strcat() "String concatenate": char stringVar = "The rain"; strcat(stringVar, "in Spain"); Note result: stringVar now contains "The rainin Spain" Be careful! Incorporate spaces as needed! 18 Copyright © 2006 Pearson Addison-Wesley. All rights reserved. 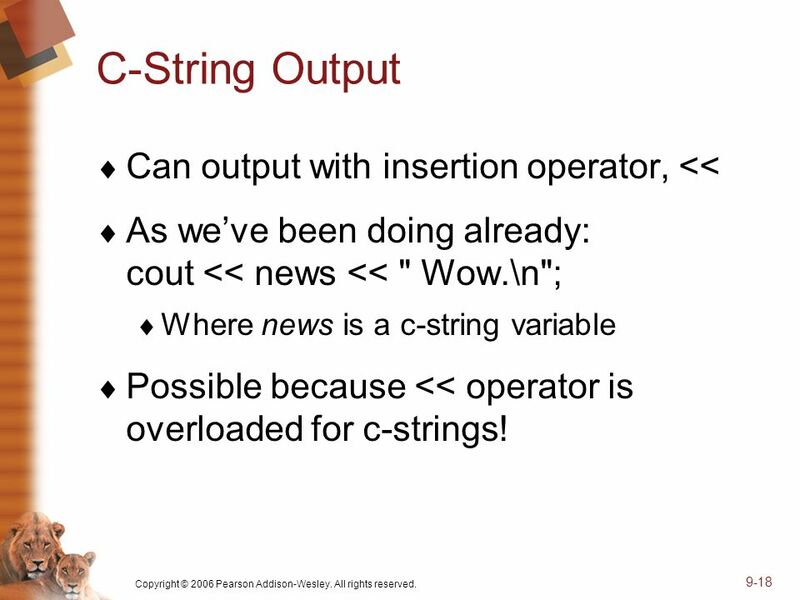 9-18 C-String Output Can output with insertion operator, << As weve been doing already: cout << news << " Wow.\n"; Where news is a c-string variable Possible because << operator is overloaded for c-strings! 19 Copyright © 2006 Pearson Addison-Wesley. All rights reserved. 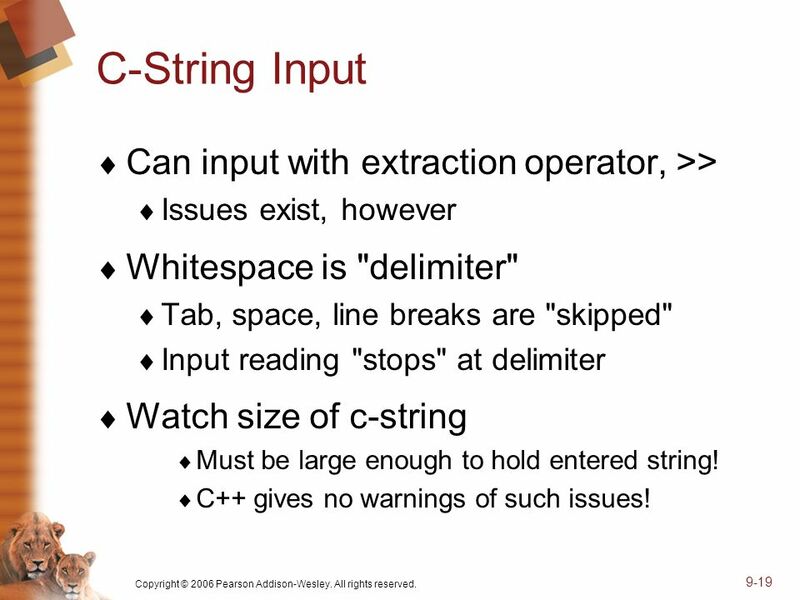 9-19 C-String Input Can input with extraction operator, >> Issues exist, however Whitespace is "delimiter" Tab, space, line breaks are "skipped" Input reading "stops" at delimiter Watch size of c-string Must be large enough to hold entered string! 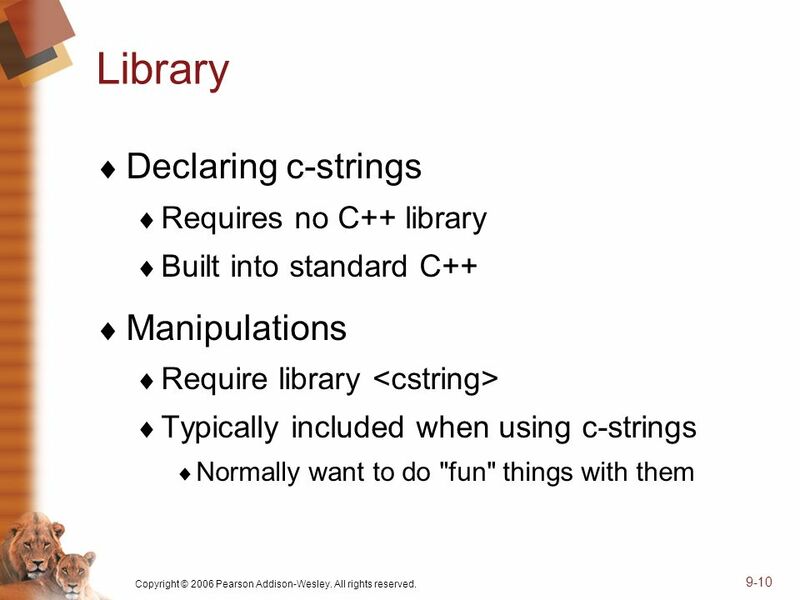 C++ gives no warnings of such issues! 20 Copyright © 2006 Pearson Addison-Wesley. All rights reserved. 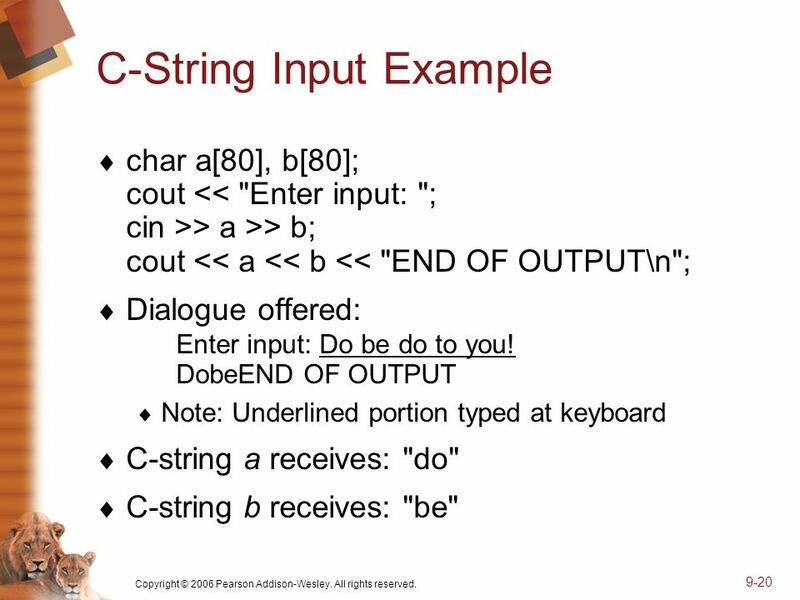 9-20 C-String Input Example char a, b; cout > a >> b; cout << a << b << "END OF OUTPUT\n"; Dialogue offered: Enter input: Do be do to you! DobeEND OF OUTPUT Note: Underlined portion typed at keyboard C-string a receives: "do" C-string b receives: "be"
22 Copyright © 2006 Pearson Addison-Wesley. All rights reserved. 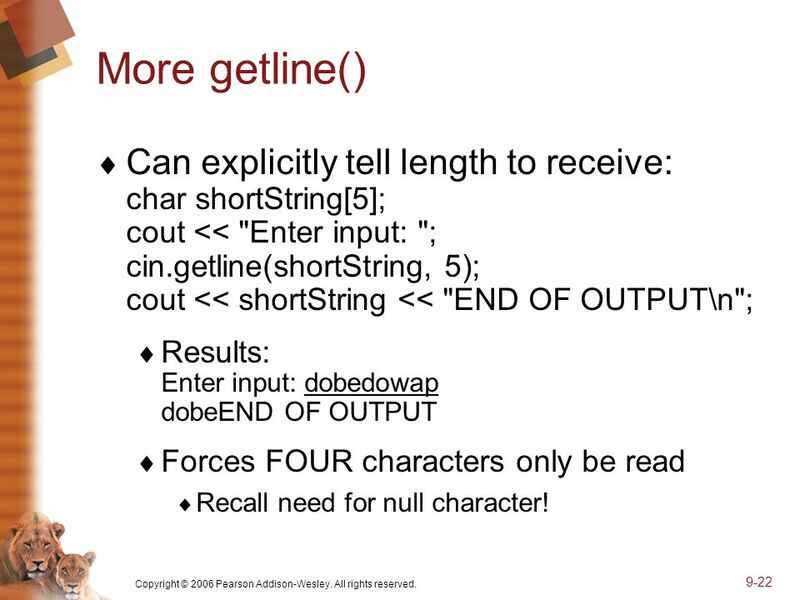 9-22 More getline() Can explicitly tell length to receive: char shortString; cout << "Enter input: "; cin.getline(shortString, 5); cout << shortString << "END OF OUTPUT\n"; Results: Enter input: dobedowap dobeEND OF OUTPUT Forces FOUR characters only be read Recall need for null character! 24 Copyright © 2006 Pearson Addison-Wesley. All rights reserved. 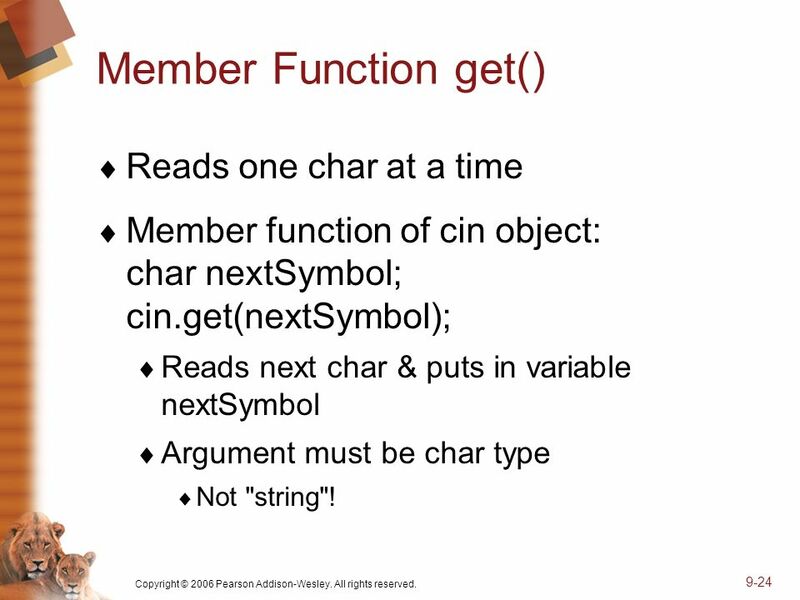 9-24 Member Function get() Reads one char at a time Member function of cin object: char nextSymbol; cin.get(nextSymbol); Reads next char & puts in variable nextSymbol Argument must be char type Not "string"! 26 Copyright © 2006 Pearson Addison-Wesley. All rights reserved. 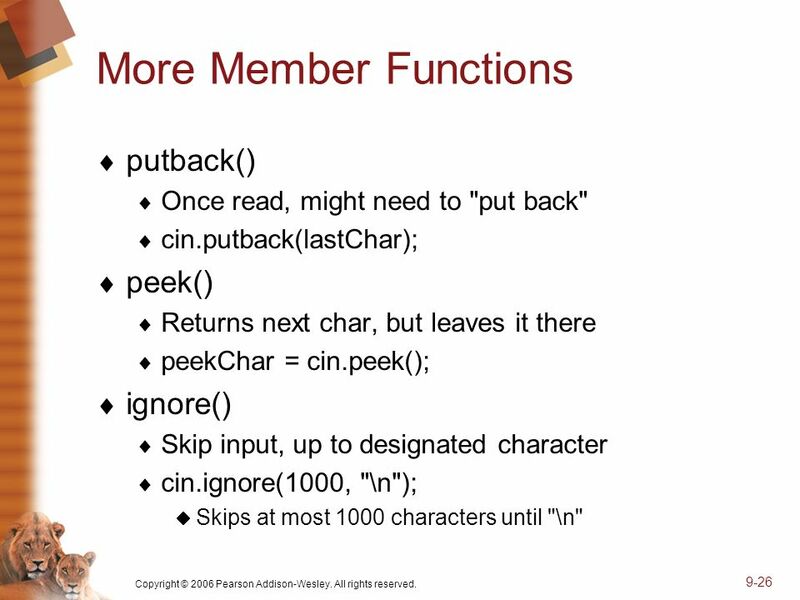 9-26 More Member Functions putback() Once read, might need to "put back" cin.putback(lastChar); peek() Returns next char, but leaves it there peekChar = cin.peek(); ignore() Skip input, up to designated character cin.ignore(1000, "\n"); Skips at most 1000 characters until "\n"
30 Copyright © 2006 Pearson Addison-Wesley. All rights reserved. 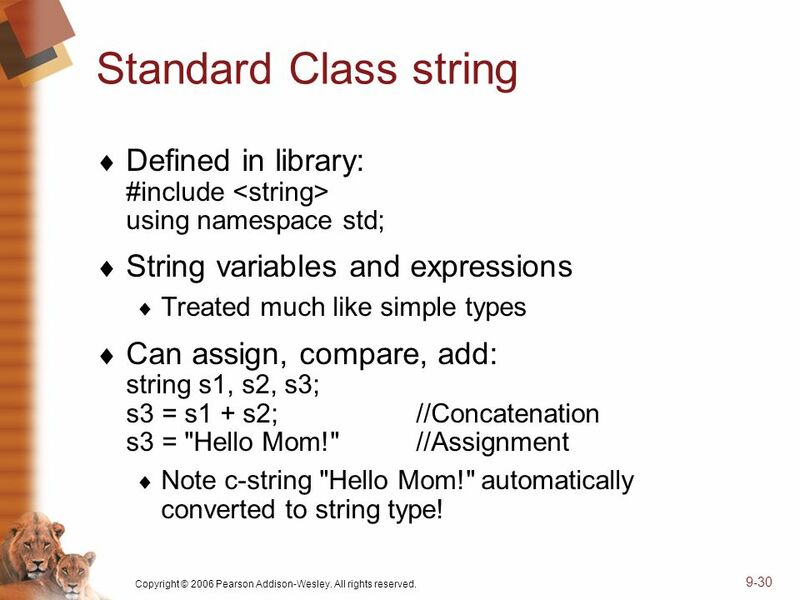 9-30 Standard Class string Defined in library: #include using namespace std; String variables and expressions Treated much like simple types Can assign, compare, add: string s1, s2, s3; s3 = s1 + s2;//Concatenation s3 = "Hello Mom! "//Assignment Note c-string "Hello Mom!" 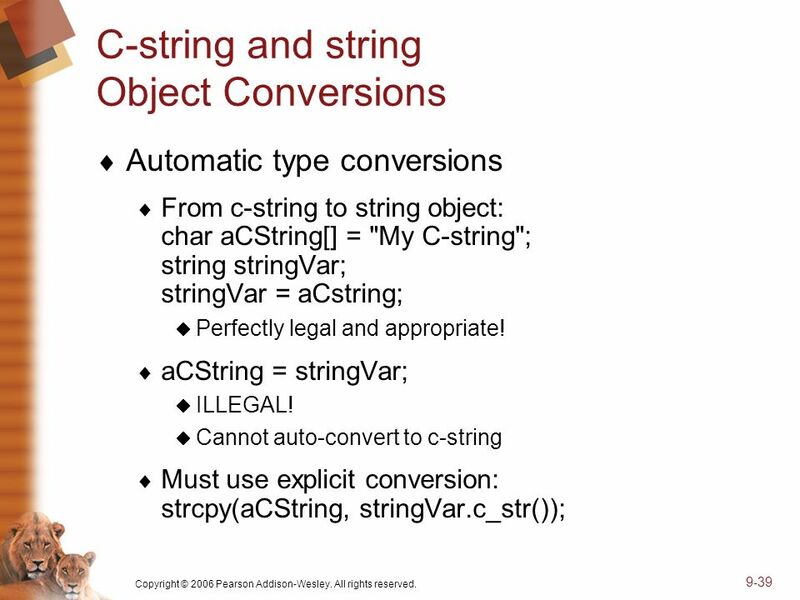 automatically converted to string type! 32 Copyright © 2006 Pearson Addison-Wesley. All rights reserved. 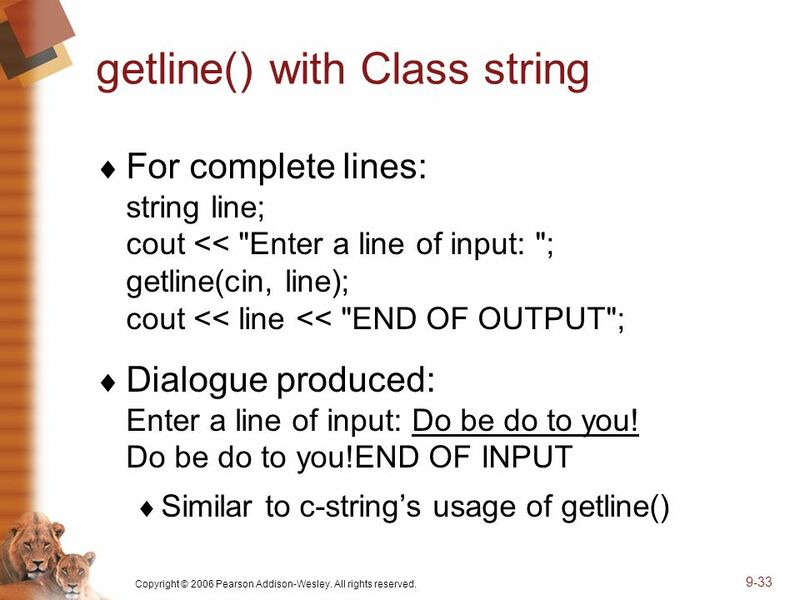 9-32 I/O with Class string Just like other types! 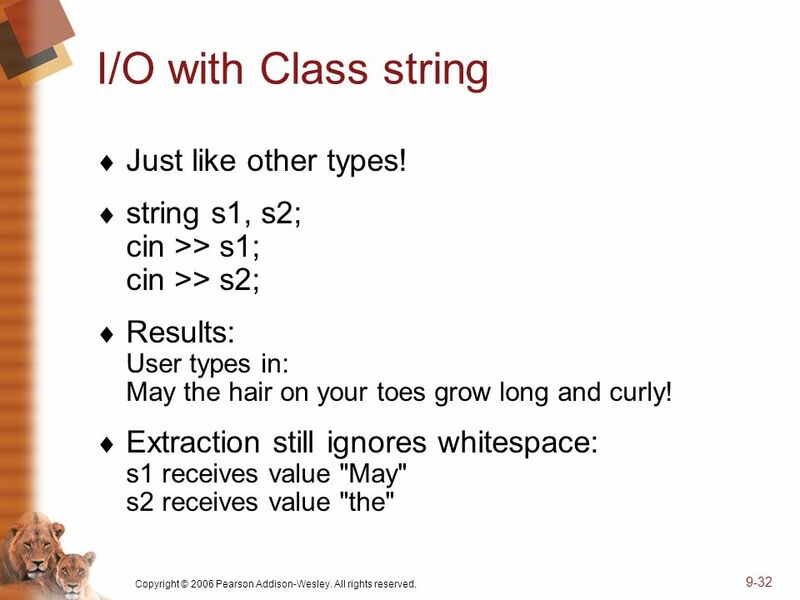 string s1, s2; cin >> s1; cin >> s2; Results: User types in: May the hair on your toes grow long and curly! Extraction still ignores whitespace: s1 receives value "May" s2 receives value "the"
35 Copyright © 2006 Pearson Addison-Wesley. All rights reserved. 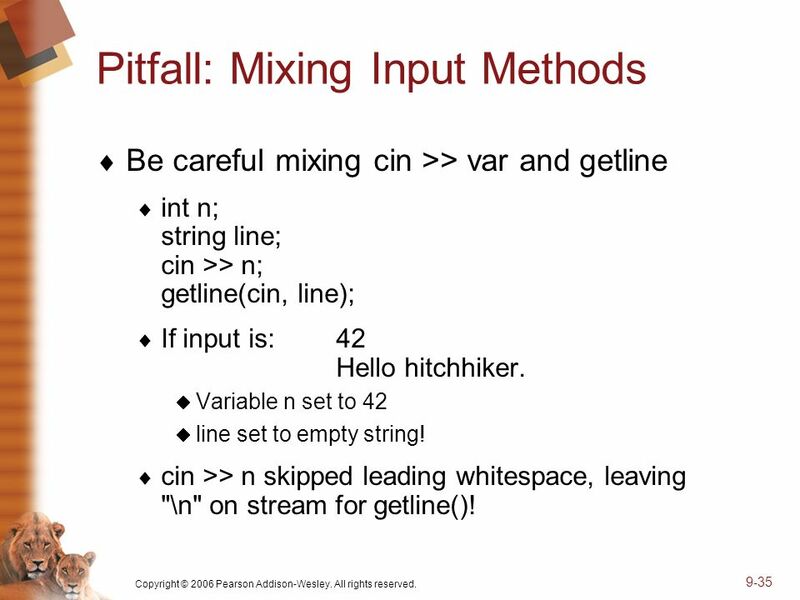 9-35 Pitfall: Mixing Input Methods Be careful mixing cin >> var and getline int n; string line; cin >> n; getline(cin, line); If input is:42 Hello hitchhiker. 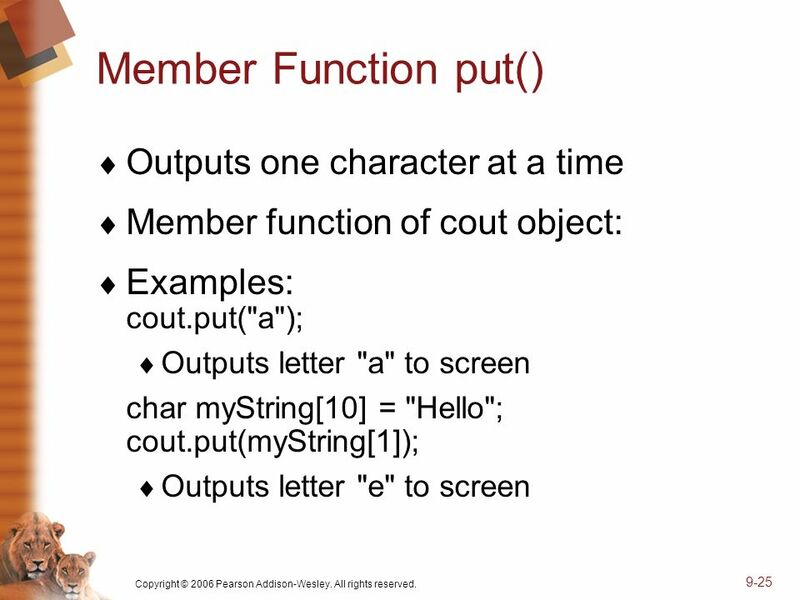 Variable n set to 42 line set to empty string! 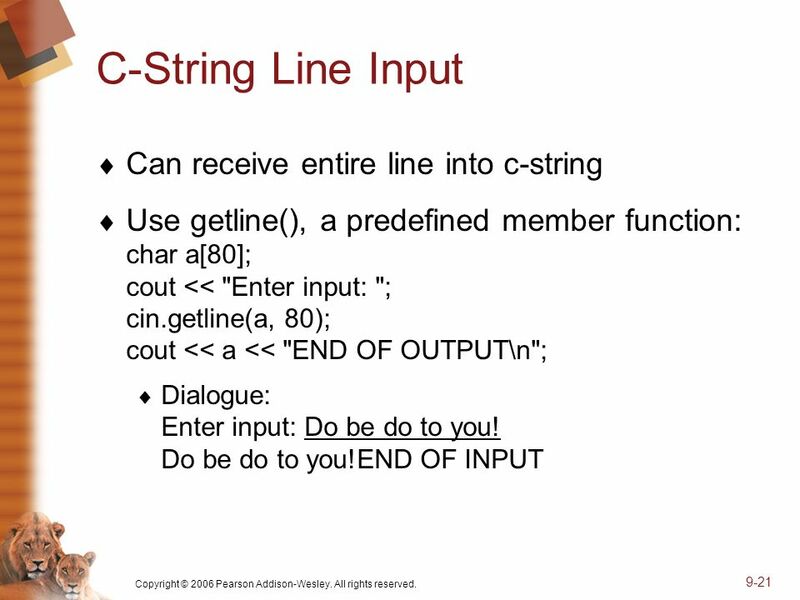 cin >> n skipped leading whitespace, leaving "\n" on stream for getline()! 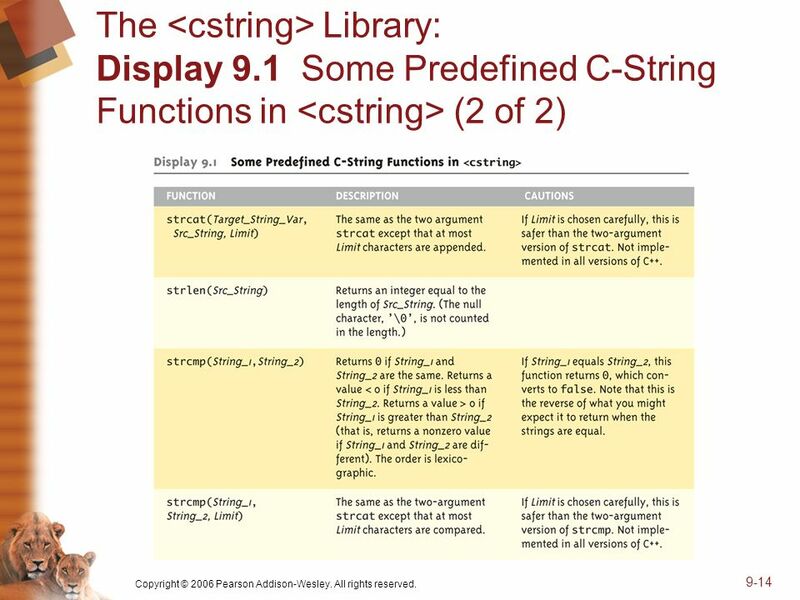 Download ppt "Chapter 9 Strings. Copyright © 2006 Pearson Addison-Wesley. All rights reserved. 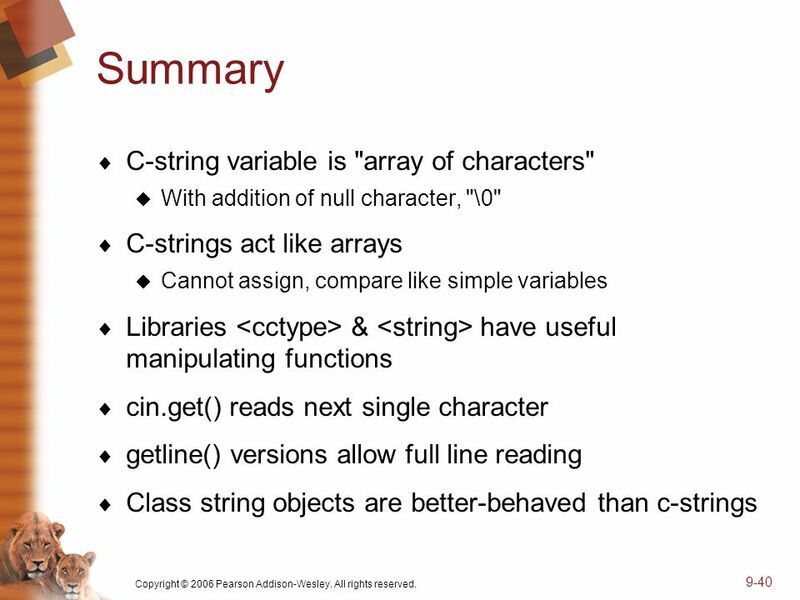 9-2 Learning Objectives An Array Type for Strings C-Strings Character." 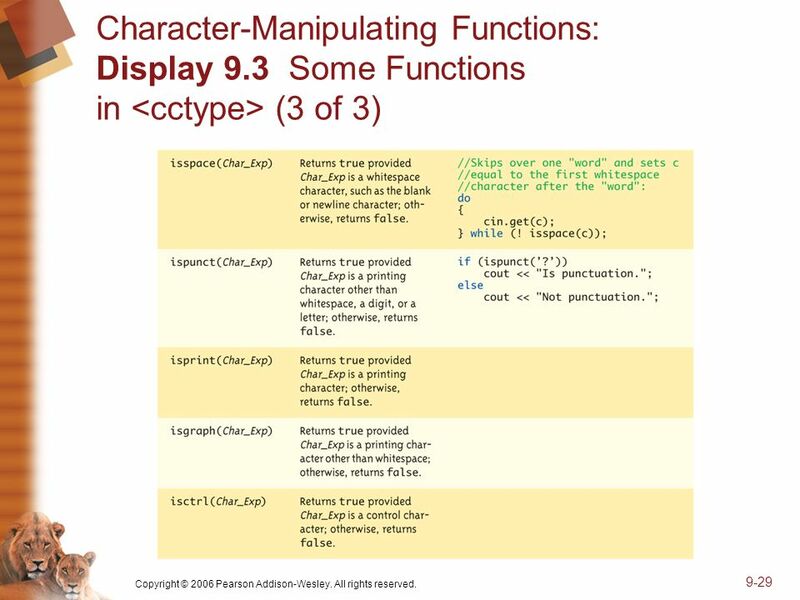 Chapter 19 Standard Template Library. Copyright © 2006 Pearson Addison-Wesley. All rights reserved Learning Objectives Iterators Constant and mutable. 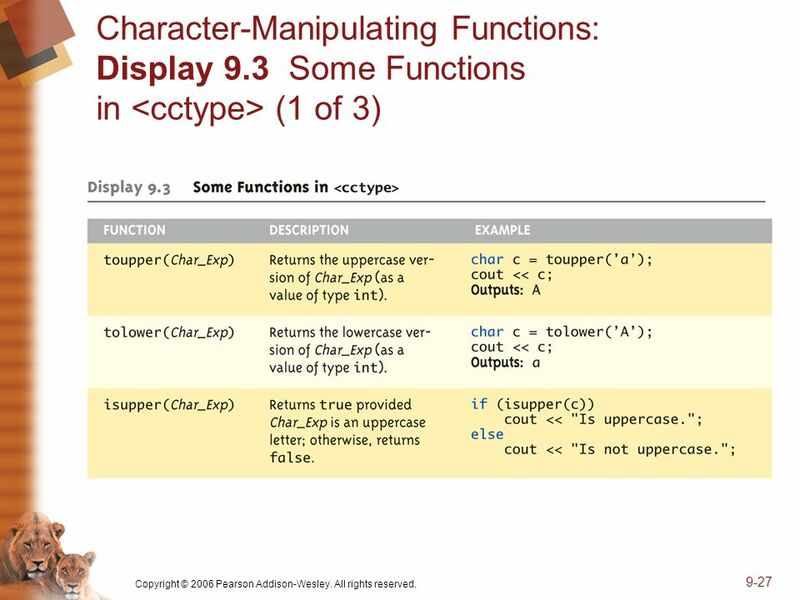 Chapter 11 Separate Compilation and Namespaces. Copyright © 2006 Pearson Addison-Wesley. All rights reserved Learning Objectives Separate Compilation. 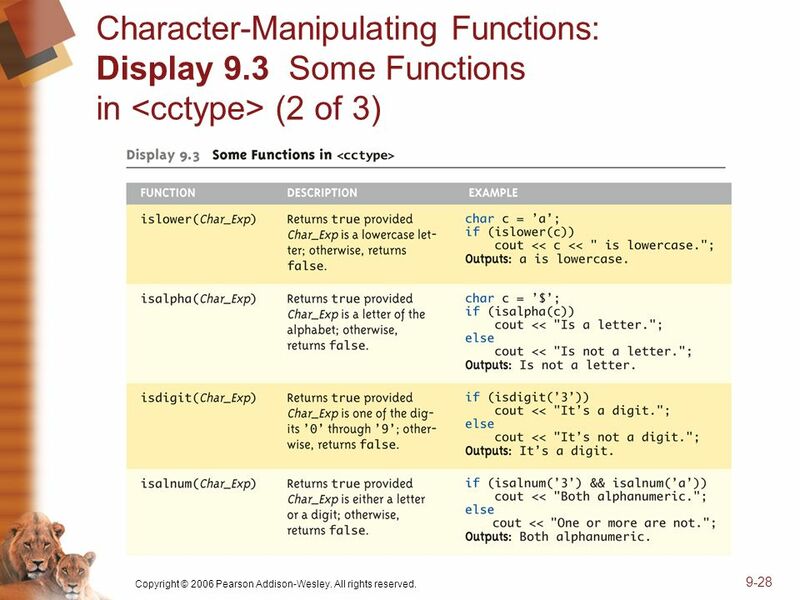 Chapter 9 – One-Dimensional Numeric Arrays. 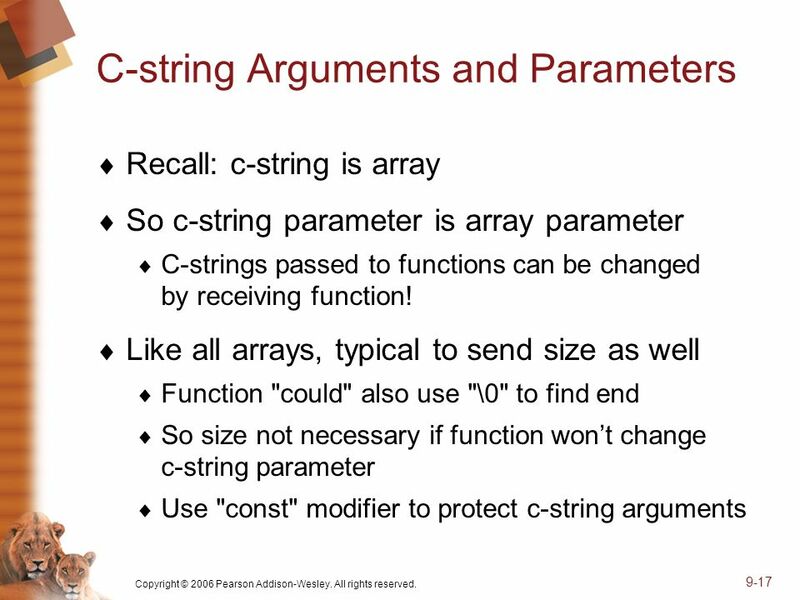 Array u Data structure u Grouping of like-type data u Indicated with brackets containing positive integer. 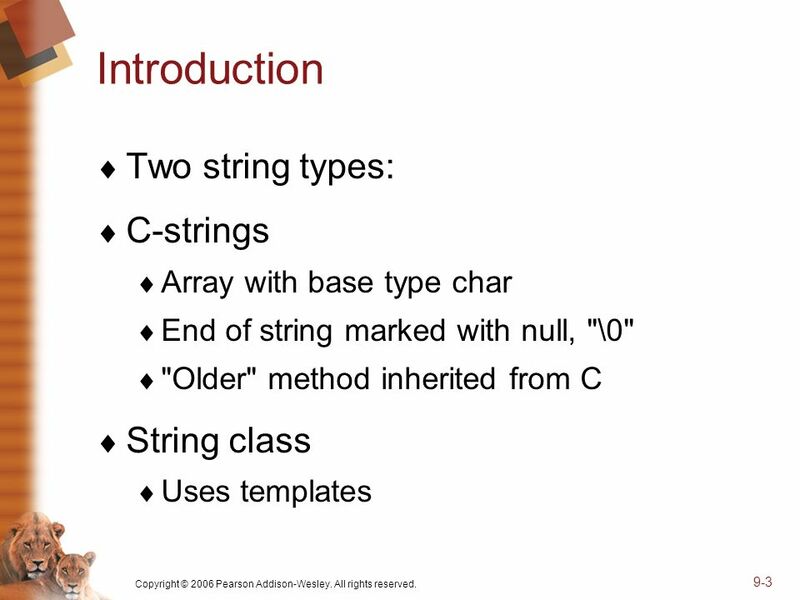 Copyright © 2011 Pearson Education, Inc. Publishing as Pearson Addison-Wesley Chapter 8: Arrays Starting Out with C++ Early Objects Seventh Edition by. Addison Wesley is an imprint of © 2010 Pearson Addison-Wesley. All rights reserved. Chapter 10 Arrays and Tile Mapping Starting Out with Games & Graphics. EC-111 Algorithms & Computing Lecture #11 Instructor: Jahan Zeb Department of Computer Engineering (DCE) College of E&ME NUST. 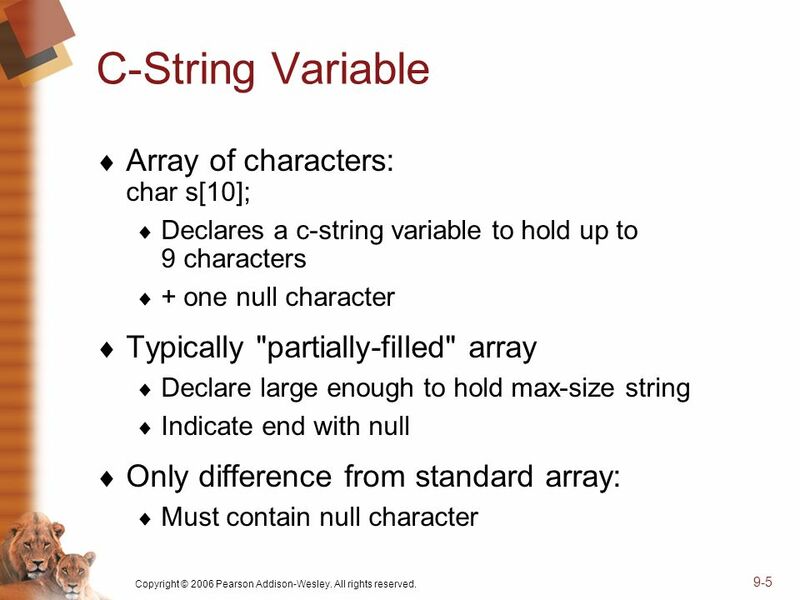  A string is an array of characters. 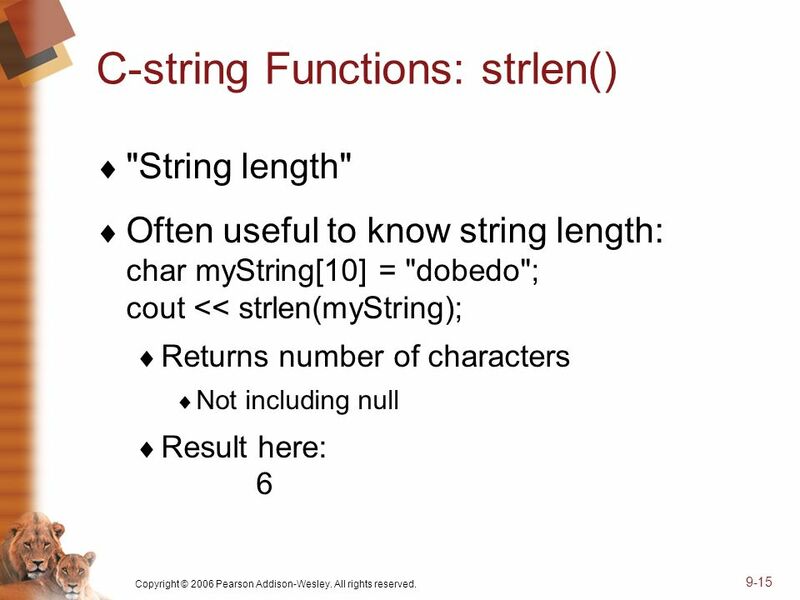  Strings must have a 0 or null character after the last character to show where the string ends. 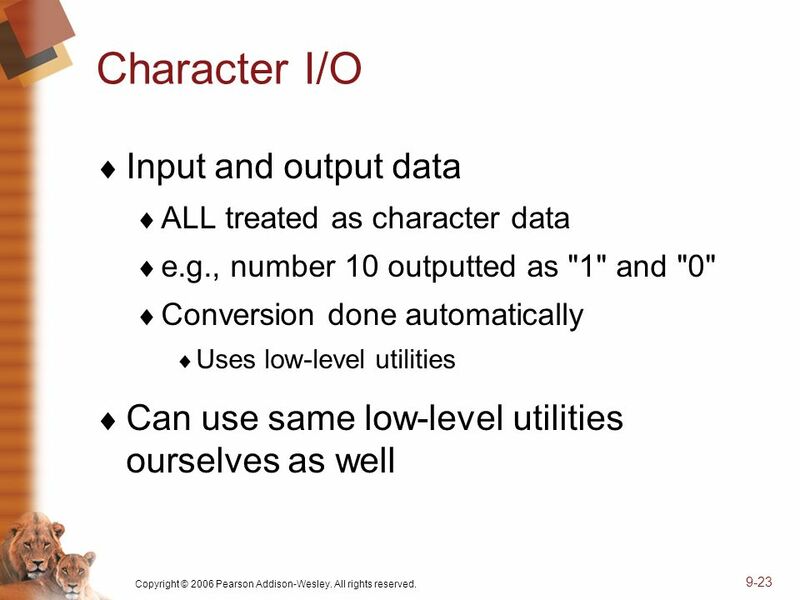  The null character. Copyright © 2014 Pearson Addison-Wesley. All rights reserved. Chapter 17 Templates. 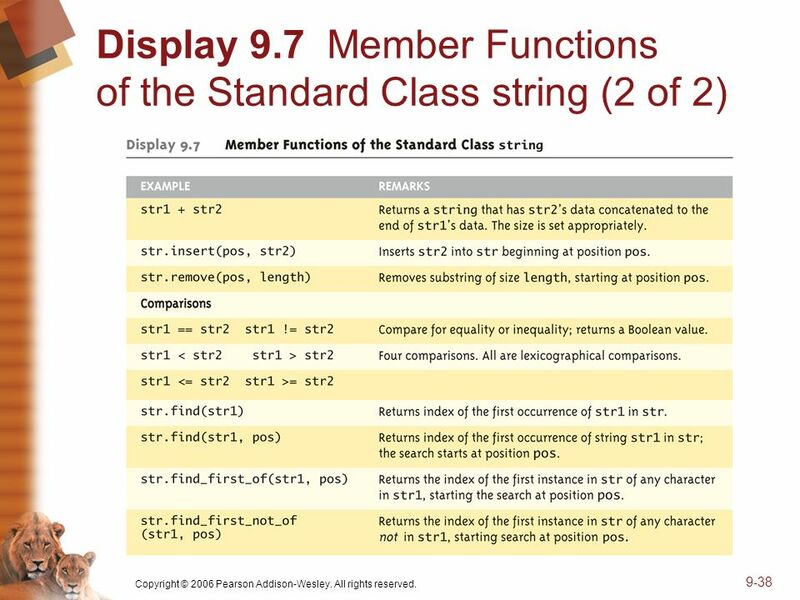 1 Chapter 10 Strings and Pointers. 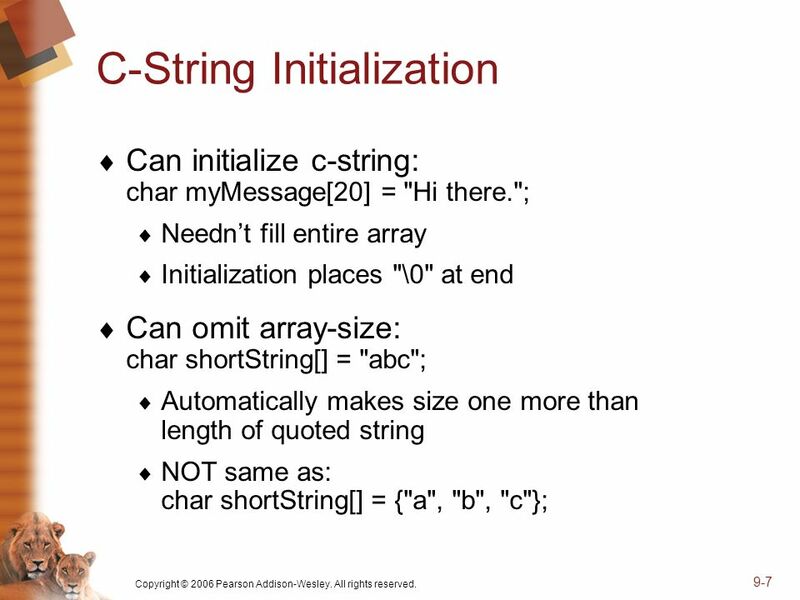 2 Introduction  String Constant  Example: printf(“Hello”); “Hello” : a string constant oA string constant is a series. What is a pointer? 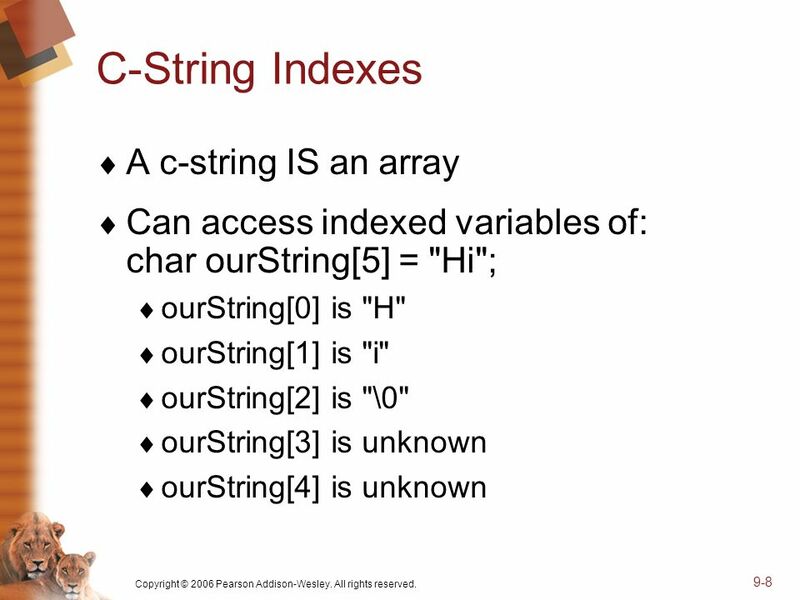 First of all, it is a variable, just like other variables you studied So it has type, storage etc. Difference: it can only store the. 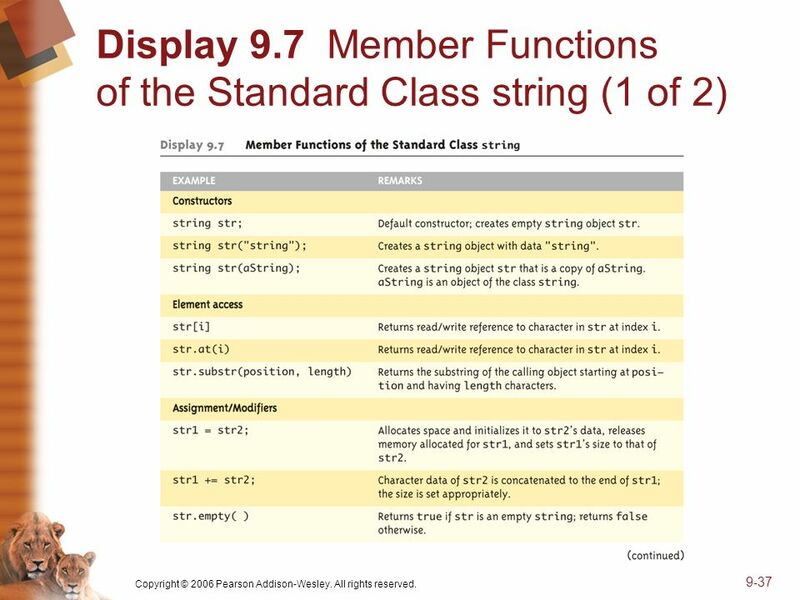 Copyright © 2007 Pearson Education, Inc. Publishing as Pearson Addison-Wesley Slide 8- 1 Overview 8.1 An Array Type for Strings 8.2 The Standard string. 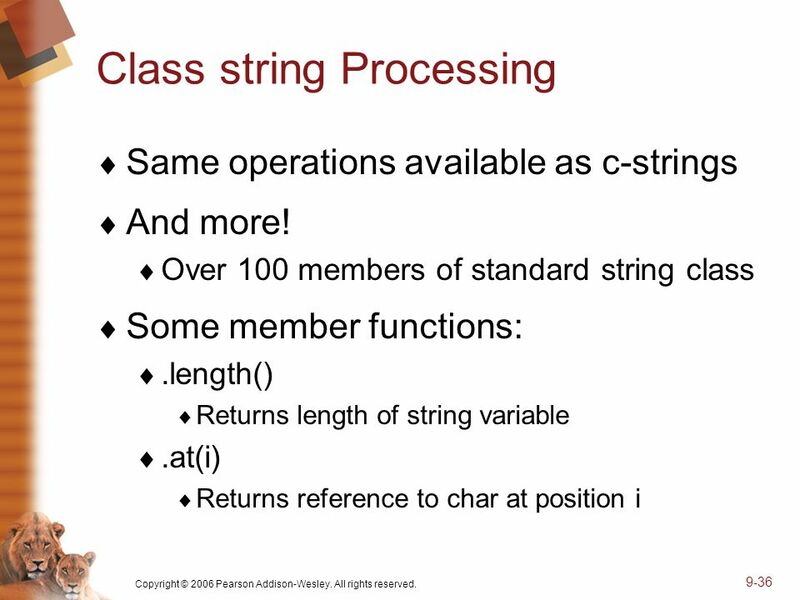 EGR 2261 Unit 9 Strings and C-Strings  Read Malik, pages 490-508 in Chapter 7, and pages 550-558 in Chapter 8.  Homework #9 and Lab #9 due next week.